Scientists working with big data regularly confront the high cost of acquiring the computational power needed to push the boundaries and innovate in data science. 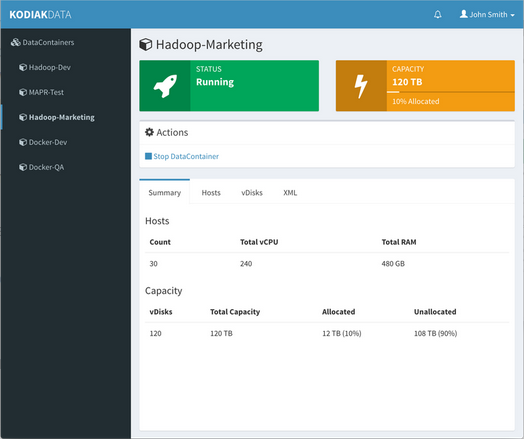 In an effort to bridge the Big Data infrastructure chasm, Kodiak Data—a leader in cluster virtualization technology—presents MemCloud, an innovative IaaS solution that accelerates the entire big data-deployment chain. MemCloud is also "the first memory-speed cloud infrastructure solution for big data scientists and software developers" that provides big data analytic clusters "at up to one-fifth the cost and five times the performance of typical leading cloud hosting services". MemCloud is built on Kodiak Data's Virtual Cluster Infrastructure platform, "the only solution capable of in-software provisioning of compute, networking, storage and data at the cluster level within minutes". Besides the hosted cloud service option, MemCloud also is available as a compact on-premises appliance for private clouds, an industry first, asserts Kodiak.